At Highland Tap and Burger, Firestone Walker’s Colorado-based representative gave us a fun-filled evening with their great brews. We started with the DBA, (Double Barrel Ale), paired with Firestone Walker’s famous beer mustard and pretzels. This was a great start to the evening since the DBA is very unique: it’s the only craft beer in the U.S. fermented in oak barrels. As an English-style pale, DBA won gold at the 2011 GABF for Ordinary/Special Bitter. Personally, I really liked the DBA; it was a great blend of malts and oakiness. I usually order the hoppiest beer available, but during a recent visit to Euclid Hall I ordered not one, but two DBA’s. Following the DBA was the Pale 31, another Gold medal winner at the 2011 GABF. Pale 31 is a dry-hopped pale, perfect on a sunny day sitting outside at one of Denver’s many great patio bars. Highland Tap and Burger’s chef prepared a salad with a Pale 31 vinaigrette to accompany the beer, an awesome match. Up next was the Double Jack IPA with an impressive 100 IBUs. As a self-proclaimed “hop-head” I love the Double Jack. I’ve loved it for a while now and drinking it in the presence of such an impressive group of female beer geeks only made it better. Made with Cascade, Centennial, and Simco hops you can’t get much better than this. The Double Jack made an ideal date for the fire-roasted tomato soup which I’m still craving. A comedic highlight to the evening came with the Velvet Merlin, a stellar Oatmeal Stout. As the Merlin presentation went on, we were let in on the little known fact that the Merlin used to be called the Velvet Merkin. A merkin is what one might call a toupee for the nether region. As it turned out, many of the ladies in the room were being educated about the meaning of a merkin for the first time, causing a room filled with giggles. In the same vein, we found out that Firestone Walker has not disbanded the Merkin name completely; they have a bourbon barrel aged Merlin that they call the Velvet Merkin. We were not privy to the sampling of this special beer, but we did enjoy some tasty Merlin brownie bites. Finishing off the evening was the very rare and expensive 15th Anniversary Ale. At $120 a six-pack it was a no-brainer to try, especially when it’s offered alongside s’more’s from an open fire. The 15th Anniversary Ale is a blend of over a dozen Firestone Walker brews, melded together to create this incredibly strong but amazing beer. 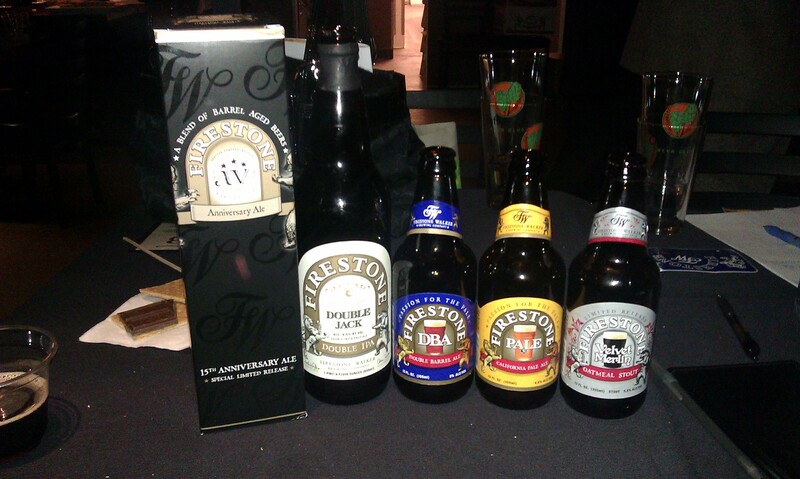 Thank you to Firestone Walker and Highland Tap and Burger for a memorable evening of eating and drinking. Check out the Firestone Walker inspired recipes from the evening on the Colorado Brewery Day’s Beer and Food Pairing page. This entry was posted in Craft Beer Adventures, Women and Beer and tagged Beer and Food Pairings, Crafty Ladies, Firestone Walker, Highland Tap and Burger.